Conference participants view an technology demonstration at UTSA. (April 26, 2007)--The UTSA Department of Electrical and Computer Engineering hosted the second annual Institute of Electrical and Electronic Engineers (IEEE) System of Systems international conference April 15-18 at the Holiday Inn Riverwalk Hotel in San Antonio. More than 200 attendees represented 15 countries including Australia, Germany, France, United Kingdom, Netherlands, Canada, Mexico, Brazil, India, Japan and the United States. 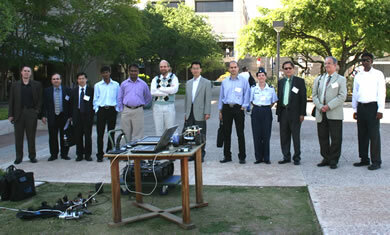 The conference included tours and demonstrations of the research facilities at UTSA and Southwest Research Institute. System-of-systems technology involves organizational and industrial organizations combining resources to solve problems. The aerospace and defense industries embrace the technology by creating "super systems" to complete tasks. "At the conference, we announced a new national consortium that will bring military, industry and academia together to network to pursue large governmental contracts," said Mo Jamshidi, conference founder and UTSA Lutcher Brown Endowed Chair Professor of Electrical and Computer Engineering. Speakers included retired Gen. Don Walker, Aerospace Corp.; Andrew Sage, George Mason University; George Wilber, Boeing Corp., retired Adm. Bobby Inman, UT Austin; Carl Siel, U.S. Navy; Dale Compton, Purdue University; James Tien, Rensselaer Polytechnic Institute; Lotfi Zadeh, University of California, Berkeley; Saeid Nahavandi, Deakin University of Australia; and Walter Downing, Southwest Research Institute. With more than 400,000 members in 175 countries, IEEE is the world's leading professional association for the advancement of technology in numerous areas including aerospace systems, computers and telecommunications, biomedical engineering, electrical power and consumer electronics. For more information, contact Mo Jamshidi at (210) 458-7074 or visit the Institute of Electrical and Electronic Engineers Web site.